Overall dimensions: 240 mm x 60 mm x 40 mm. Weight: 200 g. (without batteries). battery compartment (in the case). It is supposed to use training system at a distance of 1,5 – 1,7 m. All elements of the training system are reduced by a factor of 16,5 on the real values. “0” – exercise ” 25m Rapid Fire Pistol ” (3*«8»+3*«6» + 3*«4»). 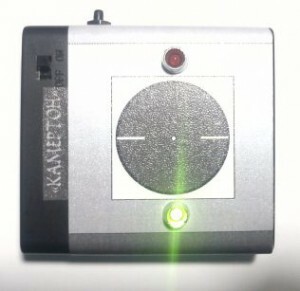 Seeing the desired number, you should release the button, and then will sound a long beep, indicating the start of work of the equipment (signal complies with the command of the judge fire from the “CHARGE”). Depending on what the parameters were chosen during configuration, the machine will work out a series for the series until then, until the power is turned off. Selecting the appropriate settings and heard the first long signal (the “Charge”) proceed to the training. From the receipt of the team “Charge” before entering the command “Attention” will take place 1,0 minute. Information indicator will be extinguished earlier, after 10 seconds after the “Charge”. Trip is made to the shooter in a minute on the preparation is not distracted by auxiliary signals. After a minute sound a long beep, indicating the command “Attention”, after which immediately lights up red “lights”. At the end of 6.0 seconds red “lights” are disabled, are green. Carry out a series of five shots. When the series ends: green “lights” are disabled, a red, five times blinking. 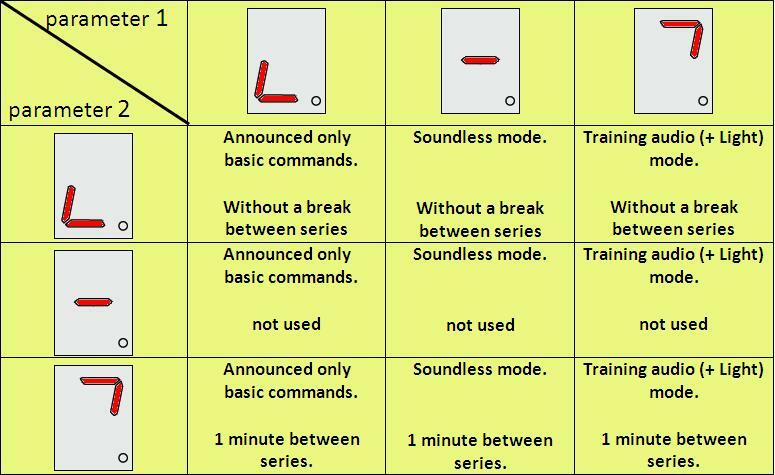 After the training system again gives a command “Charge” and the cycle will be repeated until the supply is cut off. The simulator is used to train without a cartridge in the exercise «Sport Pistol». The distance from the simulator to the athlete is 1.52 meters (on the impact of the eye). The proportionality coefficient of real values ​​is 16.5. The height of the simulator should be selected for each athlete individually, so that should be equipped with a training place stand with adjustable height. The simulator is powered by two LR06 (AA) with a total the Voltage = 3V. There is one on-off toggle switch. and one button mode selection. Signaling system simulator: LED lights and audible piezo. The choice of operating modes simulator should produce the control button after power on. If after power on, press and hold the button for a long time management, it is possible to observe the change of illumination modes of information, one after another, and the operation will not be selected until the button is released. Mode №1. Fulfills a series of 5 * (3sek.GREEN + 7s.RED) in a loop with an interval of 10-15 seconds. between the series, without sound designations moment shot. To select this mode, you must, after turning on the power, press the button once briefly and management. When you select a mode backlit displays a green LED. Mode №2. Fulfills a series of 5 * (3sek.GREEN + 7s.RED) in a loop with an interval of 10-15 seconds. between the series, with the sound designations moment shots (2.6 sec glow green lamp). To select this mode, you must, after turning on the power, press and hold the control button until the red LED flashing and immediately let go. Mode №3. Fulfills a series of 5 * (3sek.GREEN + 7s. RED) in a loop with an interval of 60 seconds. between the series, with the sound designations moment shots (2.6 sec glow green lamp). To select this mode, you must, after turning on the power, press and hold the Control button to highlight the red + green LEDs and just let it go. In all modes simulator represents the command “WARNING” and “charges” beep.